I want to try something new for NIGHT:SHIFT, and I think you’ll enjoy it! This Thursday at 7pm (seriously, I’m going to beat this dead horse forever) I’ll be doing a NIGHT:SHIFT listening party on Twitter. And I want YOU there! How does a Twitter listening party work? Well, I’ll tell you! At 7pm (My time, you can figure out EXACTLY when it starts in your local time right here.) we’ll all hit play on Bandcamp, and listen together. As the songs play, I’ll be tweeting out stories about the making of, and inspiration behind NIGHT:SHIFT. And, of course, I’ll answer any questions or comments you might have along the way! 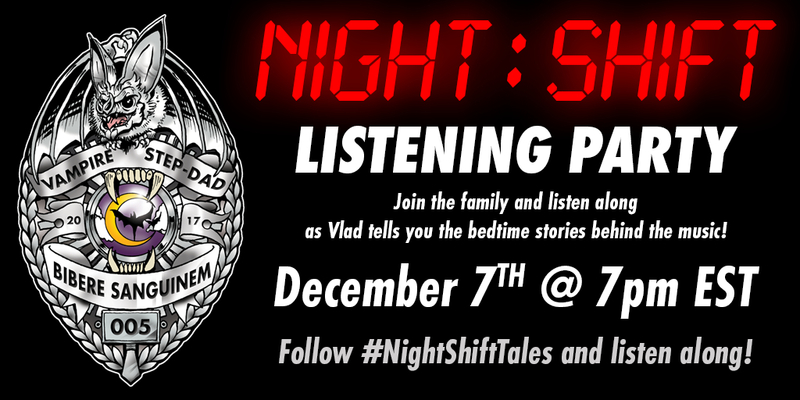 So, if you want to join in, just follow the #NightShiftTales and listen along with the whole family! Don’t have a Twitter account? That’s OK, you can read along without one. I think this will be a lot of fun, and a new way to tell the stories behind the album. So come join the rest of us and let’s party!